The fight between video cards has had its fair share of champions and losers in the past decade, and we have seen the scene settle between two giants – leaving all the other contenders laid to waste (3DFX, Matrox, S3), with NVIDIA and AMD now left standing. The battle for supremacy hasn’t let up for a long time between the two, and they have traded positions as top dog quite a fair number of times. It seems as though AMD is in the ascendancy at this moment, although anything can change at a moment’s notice. AMD’s latest offering would be the ATI Radeon HD 5450 graphics card that is touted to deliver a state-of-the-art HD multimedia and game experience at a price point that ought to carve a smile on your face. 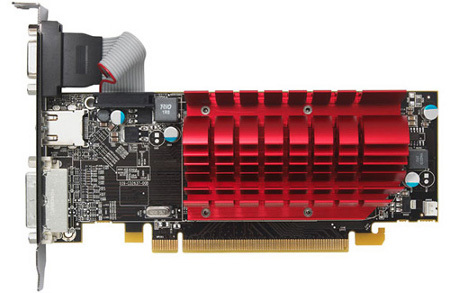 With the ATI Radeon HD 5450 graphics card, you won’t find it wanting in terms of performance as it does share a great many features that are available in the critically-acclaimed ATI Radeon HD 5800 Series, where among them include support for DirectX 11, ATI Eyefinity multi-display technology and ATI Stream technology, making it an ideal tool for those who are interested to have an uncompromising Microsoft Windows 7 experience. Of course at the end of the day, most people would be interested to know in just one thing – how much will it hit your wallet for? We’re happy to report that the ATI Radeon HD 5450 graphics card with 512MB of memory, won’t cost more than – are you ready for it – $60. $60! Now that’s something worth looking into. Among the partners who are already ready to roll out the ATI Radeon HD 5450 include ASUS, ASK, Club 3D, DMM, GBT, HIS, LDLC.com, MSI, TUL, Sapphire, VT and XFX, so you ought to be able to upgrade your machine with the latest gaming graphics card that ought to offer a decent bang for your hard-earned buck. Being passively-cooled is also another advantage since this ultra-quiet card would also double up as a suitable home theater PC component. If now is the time to upgrade your video card, why not consider the ATI Radeon HD 5450 in your crosshair? I have recently changed from Nvidia to ATI and have found the card to perform better when compaired to a Nvidia of the same price. The card also seems to be more stable than my previous one.